What a roller coaster of a winter we are having, the temps have gone from below zero to 40 degrees in two days and it looks like a warm Friday is on the way, but it will not hurt the County at all. The temps look cold for the weekend. The clubs have been busy grooming and doing some pushing of snowbanks back. The other jobs that clubs will be doing is brushing. With darn near four feet of snow in some places the trees are getting a little shorter, so if you come upon a section of trail that has a pile of branches and debris please throw them off to the side. CAUTION: Deer are everywhere they are being spotted in Caribou on trail 83B, In Ashland on ITS 85, Portage on ITS 85. Please keep an eye out all the time as we all know that deer live throughout this County. Also, as the snow is getting deeper this means that all the big game animals will be venturing out onto the trails as it is easier walking for them. Soldier Pond is reporting that their groomer is up and running well and the other one should be out of the shop soon. They are reporting that all their system should be all done by tonight. Please keep an eye out as they plan to groom all weekend. Washburn has been out on their trail 105 and ITS 83 and are reporting that their trails are in excellent conditions. They would like to send out a sincere thank you to all who have stopped by for Breakfast and lunch since the first of the year, and they are excited to see new faces this weekend. Trail 61 is not open as there is a logging operation now. There is going to be a logging operation in the Blackstone area which is trail 105 and the logging has begun so sledders please stop at the Blackstone intersection where the Nordic Lakers meet Washburn. The club would like to let people know that if you do encounter the Cat out on the trail, they will stop to allow safe passage please go slow and be cautious. If they need to pull over off to the side of the trail they may get stuck. Portage Lakers have been over their sections and are reporting great conditions. There will be a heavy logging presence on ITS 85 near the Hewe’s Brook area, please use caution in this area as the trucks will be hauling. They will be having their famous pie auction this Saturday night at Dean’s Motor Lodge starting at 6:30 after the auction there will be a dance with Common Crossing playing. Caribou is reporting that their system is in good shape and will be grooming over the weekend. Fort Kent is reporting that they their system is in good shape and will be back out once the temps cool on Friday into Saturday. Eagle Lake is reporting good conditions. There will be a reroute on ITS 85S after the Birch River near mile 8 due to logging, this will be in effect on Sunday and will last a few weeks. Please watch for signs. The detour will go towards the boat launch on the plowed road for about 2 miles. The trucks will be on this road so additional caution is advised. Fort Fairfield is reporting that they are grooming, and everything should be good by the weekend. Central Aroostook Snowmobile club is reporting that they will be over everything before the next warm spell on Friday. Ashland is reporting that they will be out today and have entire system done by Friday. Watch for a newly plowed road on 71A it is signed. There is still a lot of deer on ITS 85 between Ashland and Portage. Frenchville is reporting that their system is in great shape. They are selling raffle tickets to be drawn at their last meeting of the season. If you would like to purchase tickets check out their Facebook page. Red Arrow is reporting good conditions. Chapman Ridge Runners are reporting that they are grooming, and it will be great riding, Trail 105 South is now open. Aroostook River Snowmobile club is reporting that they will have everything groomed by Friday for the weekend. They do two small washouts on 88 heading towards Ashland. Easton is reporting they have been over their system and are reporting good conditions. Walker Siding has got their machine back from being down and will try to have everything open for the weekend. Madawaska is reporting good conditions, they have been out installing more signs and doing some brushing as well. Grand Isle is reporting great conditions. Trail 81A which has been rerouted will now be back in the original area, they will be installing signs shortly. Van Buren is reporting that their trails are in excellent shape. There is a small detour on ITS 81S due to some water, please watch for signs. Nordic Lakers trail system in good condition, please remember that 81 is rerouted. Trail 81 has been rerouted on the Holmquist Farm, it has been marked. Please use caution as sledders will need to share about ½ mile of road with logging trucks. Caswell is reporting that they are in good shape. Trail 100 to trail 94 remains closed. Trail 102 to trail 89 in the Connor area is now open. Please use caution as they are going through a logging operation. Logging operation on trail 81A please use caution. Limestone is reporting good conditions. 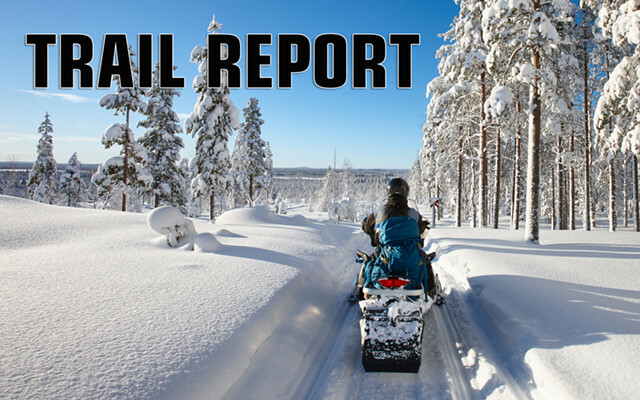 Bowlin/Matagamon/Shin Pond has their new map of their trails available to all sledders. They are available at the Chamber in Houlton or at Shin Pond Village. Awesome job! They report that after a brief warm-up and light rain on Tuesday the temperature fell into the teens early Wednesday morning allowing the groomers back on the trail. 114 north/ITS85 south out of Shin Pond to 71D had held up well. ITS85 north to where the trail meets the Oxbow Club needed attention due to heavy traffic but is now in good shape. Warm temps are expected for Thursday and Friday, but the groomers will be back on the trail when it freezes making everything good for weekend travelers. Benedicta Snow Gang groomed ITS81 Wednesday. ITS83 from Sherman to Whetstone is also ready. Big Valley Snow Club is on ITS112 and ITS83 north grooming Wednesday and Thursday. They report a few wet holes, but everything is signed, just proceed with caution. Look for a Fishing Derby in Island Falls on the 16th of February. We’ll have more details in next week’s report. We love the dedication of clubs who will hit the trail with groomers at 2 a.m. because that’s when things freeze up after a thaw! The Rockabema Snow Rangers were out grooming ITS81 and ITS85 North to Oxbow and will have all trails in great condition for the weekend. The Rockabema Club will also be hosting a pizza party and meeting this Saturday starting at 5:30 with the club meeting starting at 6. This is a great time to stop in and join the club! There is a stretch of ITS83 approximately 1 mile south of Island Falls that has been plowed and opened for a logging operation. The trail goes right through the wood yard so please proceed with caution and yield to any machinery working in the yard. Molunkus Valley Snow Drifters are seeing lots of traffic on the Bible Point Trail and caution riders to watch out for wild life. ITS83 and 83A are in great condition. Next weekend on the 16th the club will be hosting a poker run with registration starting at 9 at the clubhouse. All hands must be turned in by 3 p.m. There will also be chili and chicken stew provided as well as a silent auction. Eastern Maine Snow Riders have groomed ITS110 to Macwahoc as well as 3 to hook up to the Molunkus trails and report excellent conditions. Meduxnekeag Ramblers have groomed ITS86 and ITS105 along the border and completed club trail 81 today while another groomer was opening up ITS86 to St. Croix Lake. The rail bed, ITS83, has also been groomed. All trails are in excellent condition. As always there is a breakfast at the Wiley Rd. Clubhouse on Saturday from 6 a.m. to 9 a.m.
OxBow-Masardis Snowmobile Club trail 71A now has a major plowed road with heavy trucking, trail has been signed. ITS 85 and ITS 86 should be all groomed by Thursday. Fort Fairfield Snowmobile Club Breakfast Sunday February 10. Breakfast is from 7-10 at the Clubhouse located on the Strictland Road. Snowmobile Poker run on this Saturday at the Lonesome Pine Trails. Registration at 11, proceeds to benefit the adaptive ski program. Caribou Snowmobile club membership meeting Tuesday the 12th at the Recreation Center, Spaghetti will be on the menu. Supper starts at 6:30. Cold Mountain Snowmobile club will be having a breakfast on February 17 at the Grand Isle Community Center from 7-11. Washburn Trail Runners clubhouse will be open Saturday 7am to 2pm and Sunday 7am to 12. Chicken stew Friday February 15 from 4:30-7 at the Pleasant Ridge Riders Snowmobile Clubhouse in Caswell. Sly Brook snowmobile club will be having a steak feed on February 23rd 4:30-7, proceeds to go towards groomer fund. Presque Isle Stew night at the Clubhouse on Friday’s starting at 5pm. Saint Francis Sno Angels will have their clubhouse open for lunches starting at 11am and will continue throughout the winter. City of Caribou and the Caribou Snowmobile Club will be co-hosting the Larry Doody Memorial Radar Run on Caribou Lake. February 23rd from 8-4. Please check out the Caribou Snowmobile Facebook page for more information. For sledders who are interested, there is now snowmobile storage available for monthly accommodations in Caribou. Call 498-3508.